Montessori School of Maui will launch the first ever ‘Taste of Upcountry,’ a farm-to-table culinary celebration on Saturday Oct. 8 from 6 to 10 p.m. The benefit will showcase Maui chefs at the school’s Makawao campus. 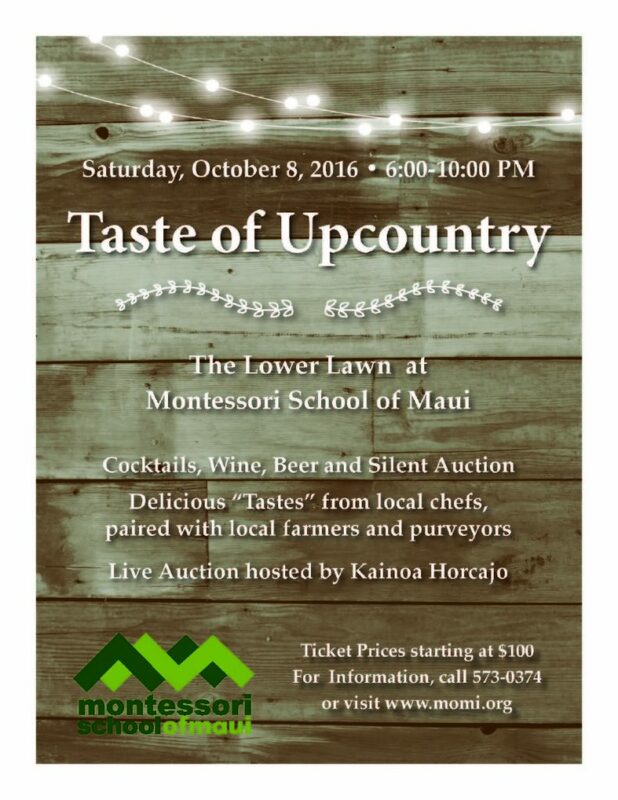 The first Taste of Upcountry event will be held on Saturday, Oct. 8 at Montessori School of Maui in Makawao. The event will feature some of Maui’s best chefs, live music and more! Tickets are on sale now. The ‘Taste of Upcountry’ is designed to highlight Maui’s chefs, local farmers and purveyors who provide an abundance of food and produce on the island. The launch of the event aims to create a tradition of sharing and enjoying farm-to-table cuisine with the community. The benefit will be hosted by emcee Kainoa Horcajo and will feature great food, a silent and live auction and live acoustic Brazilian music by ManaBrasil. Cocktails, wine and beer will be available for purchase; the event is open to the public for those age 21 and older. 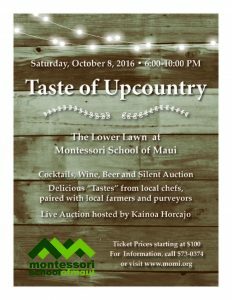 As the Montessori School of Maui’s primary fundraising event for the 2016-17 school year, the Taste of Upcountry will generate proceeds to support the school’s operating budget. Each year, the school raises funds for student programs, teachers’ professional development, campus maintenance costs and tuition assistance for students. General Admission tickets start at $100. Seated General Admission Tickets are $125 and VIP Tables of 10 start at $2,500. Montessori School of Maui is located at 2933 Baldwin Ave. in Makawao.